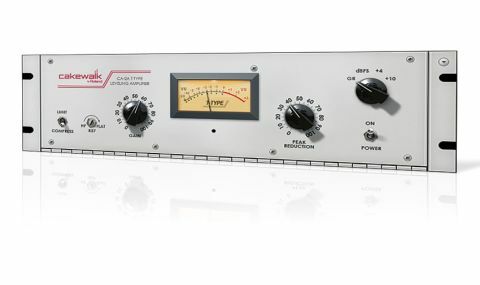 Yet another excellent LA-2A emulation for Mac and PC, with the most responsive metering and interface we've seen. Useful R37 emphasis control. Successfully delivers the LA-2A sound. Highly responsive metering. Two photocell settings. External sidechain. Mac minimum OS X 10.7.5. Upgrade charge from PC2A. Renowned for its transparency and musicality, the Teletronix LA-2A is a - possibly the - classic opto compressor with tube amplification. The CA-2A is Cakewalk's latest plugin emulation of it, a port of their previous Sonar-only version (the PC2A) into VST/AU plugin formats for Mac and PC, joining their fabulous Z3TA+ synth on the cross-platform train. So, it now comes in both regular plugin and Sonar ProChannel Module versions, the latter also renamed CA-2A. Other than that, there's only one further change: the addition of an external sidechain input. "In addition to the basic controls, you also get access to the LA-2A's 'emphasis' circuit via the R37 control"
The CA-2A features the standard set of LA-2A controls: Peak Reduction (threshold), Gain (gain make-up), and two Ratio settings (Compress and Limit). Metering options include Gain Reduction and analogue simulated calibrations at +4dB and +10dB, and, rather usefully, Cakewalk has added a 0dBFS setting for DAW use. In addition to the basic controls, you also get access to the LA-2A's 'emphasis' circuit via the R37 control; an external sidechain (how you route signals to this will depend on your host DAW); and a Photocell Memory setting with Classic and Fast Reset options. Classic mimics the original hardware, where periods of low photocell activity can lead to popping when the circuit is suddenly hit with new transients. Fast Reset reduces this effect, creating a more predictable response. The first thing to note about the CA-2A is how responsive the meter is, and similarly the controls. Ergonomically, this is arguably the best LA-2A emulation yet. "Once you start to wind up the Peak Reduction, the CA-2A really comes into its own, with the fastest transients handled very sympathetically"
Sonically, we found it to be pretty neutral with no gain reduction applied (transparency varies between LA-2A emulations). Once you start to wind up the Peak Reduction, though, the CA-2A really comes into its own, with the fastest transients handled very sympathetically. There's also a glue-like nature to the characteristic 'two-stage' release phase (in an LA-2A, the first half of the release takes about 60ms, with the rest being in the order of seconds), adding body to everything from vocals and acoustic guitars to toms and kicks. The two-knob design is ideal for the compression novice as it encourages you to focus on those basic settings and use your ears rather than getting sidetracked by ratios and release times. Furthermore, like the original hardware, the CA-2A's two Ratio settings (Limit and Compress) are in no way restrictive, with the frequency content and level of the input signal influencing the behaviour and sound. The CA-2A isn't a jack of all trades or a super- fast design like the equally famous 1176LN compressor, and we've found ourselves using it primarily for its gentler 'gluing' characteristics, sometimes combining it with another compressor for bite. Of the additional features, we found the photocell memory option interesting but much less useful than the HF emphasis - the latter is an excellent inclusion and can be particularly helpful in preventing low frequencies from unduly influencing things. Cakewalk has done a fine job with its take on the LA-2A, and the only mild annoyance is the OS X 10.7.5 requirement for the Mac version. Ultimately, there are so many great LA-2A emulations out there now (UAD recently added three new variants, for example) that personal developer preference could well be the deciding factor in your choice of which one to buy. Don't let that rule the CA-2A out of your investigations, though, as it's one of the best out there.